In keeping with the NFL's standard in-season practice of making coaches available to reporters from the opposing city on the Wednesday before an upcoming game, Steelers coach Mike Tomlin did a conference call today with the beat crew from Jacksonville. Well, sort of. He had little patience for any of it, and he let it be known pretty quickly. Someone (I don't know who, not Vito Stellino though according to Tania Ganguli) asked Tomlin about the Jaguars 2007 match up with the Steelers in Pittsburgh in the playoffs, a game the Jaguars won. Tomlin responded by saying, "I understand that might have been a big game in Jacksonville, but that's old news." 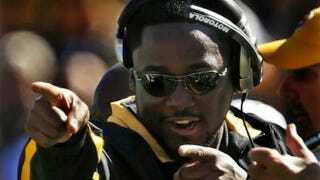 Tomlin then said "Anybody got questions relative to this week? ", paused, and then hung up the phone while the next question was being asked. UPDATE: The Florida Times-Union has a lengthier, first-hand account of what happened, and it appears the conference call wasn't as fast as that other report indicated. Tomlin was asked about that 2007 playoff loss to the Jags, and he grew impatient when somebody asked a follow-up question about whether he had complained to the league office regarding an alleged hold that wasn't flagged late in the game.